Getting to sleep at night can be difficult. It can be even more difficult if you're having trouble finding the right supplement to help you lull you to sleep. The makers of Hypnos things that they have one of the best formulas on the market when it comes to an all natural sleep aid that can help you relax before bed and get better quality rest. Obviously, we had to take a closer look at this product and evaluate how true their claims are. 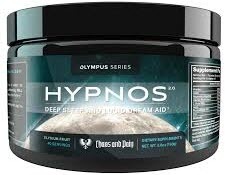 Below is our review of Hypnos Powdered Sleep Supplement. We hope it is both informative and educational for you. Have you ever wanted a supplement company to speak to you like a surfer Dude from the 1990s? Then Chaos and Pain, the Savage company that produces radical supplements like Hypnos, is totally for you, bro! In all seriousness, though, whether they're speaking ironically or marketing to a specific target audience, most people may get a chuckle out of the way they present their list of ingredients. Phenibut, which comes in at about 500 mg per dose, is supposedly an analog of GABA. GABA, in case you weren't aware, is a neurotransmitter that helps you feel relaxed and calm, which is a big help to anyone who struggles to sleep at night. But unlike other GABA analogues, phenibut is capable of crossing the blood brain barrier easily "without paying any tolls! ", which should help make it more effective. But Chaos and Pain would be remiss if they didn't add in actual GABA to their sleep formula. Since GABA helps you feel relaxed and less anxious, it's a pretty good idea to take some before bedtime. But Chaos and Pain has als discovered a mysterious connection between GABA and muscle regulation, which means you might be able to tone your body while you sleep...somehow (so they say, anyway). Next, there's Magnesium, which is used to help GABA receptors function more efficiently, and help your body eliminate excess levels of cortisol (the stress hormone) at night. Some scientific studies show that magnesium can also help improve mental health overtime - which could either be a direct benefit, or a side effect of improving your rest and therefor brain health. The use of valerian root as a sleep aid and as a dream enhancer dates all the way back to Hypocrites himself. Mankind has known for thousands of years that not only does valerian root help you relax before bed, but it can also make your dreams more vivid and easier to remember. As you may expect from an herbal sleep aid, Hypnos also contains hops extract and passion flower. These are two very popular natural ingredients that help promote relaxation before bed. There's also a total of 5 mg of melatonin, the sleep hormone that some people's bodies don't produce enough of at the right time to get them sleepy before bed. Lastly - and if it's surprisingly - Hypnos also contains l-dopa. Chaos and Pain postulates that this precursor to dopamine, the neurotransmitter which is responsible for pleasurable feelings of brain, plays a vital role in sleep. But they don't necessarily dive deep into explaining how, or why it's such an essential part of their formula. Chaos and Pain has a fairly diverse portfolio when it comes to their supplements. For the most part, they seem to be a company whose main focus caters to general health and wellness, especially for people who are fitness-oriented. The marketing behind Hypnos puts a strong emphasis on getting better sleep for the purpose of physical recovery after hard workouts. It also advertises itself as a lucid dream aid. While some may argue that deeper, more vivid dreams is a sign of higher quality sleep, the scientific evidence to support this theory is not as robust as you might think. Furthermore, anyone who suffers from night terrors or who has frequent nightmares in general may be wary of taking a sleep supplement which could cause their bad dreams to become more prevalent and intense. As far as we can tell, there is some promise behind Chaos and Pain's claims about the effectiveness of their sleep product. That contain several high quality natural sleep ingredients, such as melatonin, hops, passion flower, GABA, and valerian root, to name a few. But our research didn't necessarily justify the addition of other certain ingredients. Specifically, phenibut and l-dopa. Fun stories about passing tolls and hat tricks aside, we feel like the addition of the phenibut might be a bit unnecessary; furthermore, most research shows that dopamine activity in the brain has a stimulating - rather than relaxing - effect. And we're not entirely sure that you want to put something in your body that is going to stimulate your brain when the goal is to relax into a healthy slumber. Currently, you can buy the Hypnos sleep aid straight from the manufacturer's website on sale for $39.99. It comes in one of two flavors: lemon berry nectar, and elysium fruit. Purchasing directly from the manufacturer comes with a money-back guarantee, but our review experts had a hard time finding exact details on how much time Chaos and Pain is going to give you to return the product. Strangely enough, the majority of real estate on their shipping and returns webpage is dedicated to explaining how often their products get tangled up in customs offices as opposed to discussing specific details of their return policy. Is Hypnos the Only Safe, Natural Sleep Aid Out There? No, not by a long shot. There are scores - if not hundreds - of different natural sleep aid products you can try for yourself if you're having trouble falling asleep at night. But the problem with doing that is that it will eventually get costly and expensive before you find the sleep aid capable of giving you the rest you deserve. Luckily for you, we've done a lot of the hard work for you already. Just take a look at our reviews page to see which sleep aids are worth your time and consideration. Good luck, and sweet dreams!